When Sienna’s parents contacted me about their family, my heart immediately went out to them. Sienna (6) is a triplet. Her brother, Harry and her sister Grace were born without complications, however Sienna suffers from wheelchair bound Cerebral Palsy, Autism and Epilepsy. Sienna’s parents reached out to me when I put the call out for families for the first ever heART Project workshop in Melbourne. For Sienna, and her brother and sister I wanted to bring this dream to life. After thinking through several ideas, I landed on the story of Peter Pan. Casting Sienna as Wendy, and Harry as Peter Pan and Grace as Tinkerbell, the story provided a visual way to create this dream. An important aspect of this heART Project, the first ever workshop, was to teach other photographers the skills needed to make the impossible, possible. Each attendee had their own reason for attending, but all shared a common goal, the desire to make a difference with their art. This workshop and future heART Project workshops gives compositors (photographers with some experience compositing in Photoshop, or previous Story Art Workshop attendees) the opportunity to expand their skills to enable them create incredible imagery that changes lives. Our Melbourne heART Project Workshop saw six photographers, including Jacqui Griffin, Tahliyah’s mum [see Tahliyah’s Story], participate in a learning experience beyond anything they had experienced before. Sienna and her family arrived on day two, after staying nearby thanks to The Sebastian Foundation. During the session I taught the other photographers all about the importance of capturing the elements with the correct perspective and lighting. Putting these Story Art images together requires careful planning and checking along the way. Before bringing Sienna in, I had attendees pose in place and via tethered capture, we ensured that everything was set up ready for Sienna’s shoot. It was important that we didn’t prolong Sienna’s session longer than necessary. It was also important that Sienna was as comfortable and happy as possible during the experience. As I explained to the workshoppers, the challenge should not be the subject’s to bear, it should be the photographer’s. Although Sienna was still a little overwhelmed, she delivered some beautiful smiles and the most incredible images were captured during her session. Following the workshop I began bringing the series together. The creation of these images can be seen within the speed edit featured in Sienna’s Video below. Sienna’s family was given a very special gift from The Sebastian Foundation, a family holiday. This family, like so many special needs families, endure incredible challenges every single day. The foundation recognise this and seek to bring joy, and relief to families like Sienna’s. If you know of a family in need please don’t hesitate to share their story with the Foundation. If you know a family that would be blessed in particular by their very own heART Project, please write to The Sebastian Foundation. 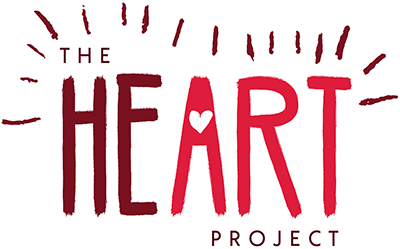 Our new website The heART Project, will share projects with you and showing you ways you can get involved. Aimee, the 12 year old creator of The heART Project Logo, pictured here receiving some special gifts from The Sebastian Foundation in thanks. It was a very special honour to present the final series in print to Sienna’s family in person. I’m a big believer in print being more powerful than digital when it comes to presenting images. It wasn’t enough to send this heartfelt piece via inbox message. I wanted the first time the family saw it to be framed and in print. Their response was truely heartwarming. I had Jacqui Griffin with me, and this was a very special experience for her to be part of, having experienced the same thing herself just a few months earlier with Tahliyah’s image ‘Free to Fly’. I printed Sienna’s series on Canson Infinity Rives (Printmaking Rag) and my awesome framer Michael – Art Defined presented the prints beautifully (can’t thank you enough Michael for fast tracking this).